You have probably never heard of The Tri-State Transportation Campaign, but if you live in Connecticut, New York, or New Jersey, you should start doing your research. This group states that their mission is to reduce car dependency in the tri-state, but upon deeper examination, we learn how this seemingly virtuous goal, and organization, is actually part of a much larger nefarious plan, which originated at the United Nations, known as Agenda 21. Without diverging to far from our examination of The Tri-State Transportation Campaign (TSTC), it is important for the reader to have an understanding of what Agenda 21 is. There are many resources available online, and in print, to help a person become familiar with "United Nations Agenda 21", and I highly encourage everyone to do their own research. In short, Agenda 21 can be described, as one expert has stated, as "the action plan implemented worldwide to inventory and control all land, all water, all minerals, all plants, all animals, all construction, all means of production, all energy, all education, all information, and all human beings in the world." To control the world, which essentially is what the Agenda 21 plan is, the United Nations must first usurp the sovereignty, or decision making power, of each individual country, state, county, city, and town. This is done slowly, and incrementally. The United Nations agenda comes into your local area through various NGO's (Non Governmental Organizations) and non-profit organizations, like The Tri-State Campaign, each assigned with a task of implementing a small part of Agenda 21, by influencing legislators, and effecting changes in local law, rules, and regulations. We will see how The Tri-State Transportation Campaign's mission to "reduce car dependency", is really Agenda 21's mission to, as Rosa Koire, author of "Behind The Green Mask: U.N. Agenda 21", puts it, force people out of their private cars, and onto their bikes. If the The Tri-State Transportation Campaign was just made up of a bunch of people that thought cars were ruining the earth, that people should be walking, or using a bicylce, more than they are right now, and the way they pushed their belief was to set an example, by walking, or biking, or attempting to educate the public, through pamphlets, videos, literature, etc., I would have no problem with this organization. The problem with The Tri-State Transportation Campaign is that they believe we should be FORCED out of our vehicles, instead of persuaded. The Tri-State Transportation Campaign is constantly lobbying the Connecticut state legislature, to implement rules, regulations, and programs, that would make it more difficult to own, and operate, a vehicle in the state. The Tri-State Campaign has lobbied the state to implement red-light cameras, a massive revenue generating operation, that one judge in Ohio called "a SCAM that motorists can't win". The TSTC has also teamed up with the Connecticut Sierra Club, to push for tolls to be put up on "all Connecticut Interstate Highways and the Merrit Parkway." The controversial plan to build a New Britain to Hartford Busway, known as CT Fast Track, was also supported by The Tri-State Transportation Campaign. The stated goal of implementing this busway is to take 18,000 cars off of the road, every day, which, according to TSTC, "will reduce traffic congestion, carbon emissions and greenhouse gases dramatically." That sounds nice, but do you plan on giving up your car, to take the bus everywhere? I know I don't. So how are they going to get 18,000 people to stop driving, and take the bus? The Tri-State Campaign, and the rest of the organizations pushing Agenda 21, plan to FORCE you out of your vehicle, by making it increasingly difficult, financially, to own a vehicle. Interesting to note, in relation CT Fast Track, according to The Tri-State Transportation Campaign's own blog, "TSTC sponsored a trip for local and state officials from Connecticut to check out other areas of "Transit Oriented Development", to promote the CT Fast Track." This was the second such trip sponsored by The Tri-State Campaign. The article doesn't state which Connecticut officials went on this trip, or what services TSTC provided to these officials, but the fact that a group like the TSTC, that is constantly lobbying the state legislature, is sponsoring trips for state officials, doesn't seem right to me. One sample area shown to the unnamed state officials was Lowell, Massachusets, where "smart policies have helped", according to the TSTC. The goal of this project is to "maintain the walkable environment", meaning "the city basically take[s] parking out of the development equation", according to Assistant City Manager Adam Baacke. In the city of Lowell, "No parking is required for non-residential uses in downtown." As you can see, they are pushing policies that are making it more difficult for you to get around, with your own personal form of transportation. You are being forced out of your vehicle, not persuaded. Complete Streets policies require all road construction and improvement projects to begin by evaluating how the right-of-way serves all who use it. We intend to alter the balance of power in ways that impress upon users that the street has many purposes and is not simply a travel corridor dedicated exclusively to motor vehicle traffic. The Complete Streets program is part of a fundamental shift in the way the City of New Haven approaches street design. For Complete Streets to be successful, every road project for every type of roadway should be evaluated for compliance with the Complete Streets policy and guiding principles. Road projects range from minor crack sealing and preventative maintenance to milling and paving to new or realigned roads. Road types range from industrial arterials carrying high volumes of traffic to low volume roads carrying residential traffic only. 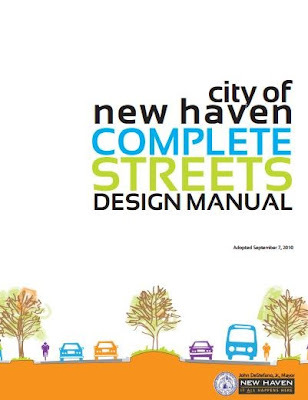 As a result of improved communications with the New Haven Police Department about the need to increase user compliance to traffic laws, the New Haven Police Department increased the number of moving violation citations issued in 2009 by 66% over 2008 levels. Interestingly, this increased traffic enforcement contributed to an increase in narcotic seizures and the recovery of a record number of stolen firearms. The City works closely with the Connecticut Department of Transportation and the South Central Regional Council of Governments on the planning and implementation of state and federally funded transportation projects in the City. It is important to note that the South Central Regional Council of Governments, is a group of unelected bureaucrats, making decisions that directly effect your local neighborhoods. Rockefeller Brothers Fund - Journalist Jurriaan Maessen, in 2003, wrote an article titled, "Rockefeller Brother Fund: We’re Buying Off Evangelicals, Mayors, Governors… For The Earth", which uses an official Rockefeller Brother Fund document titled, "Sustainable Development Program Review, 2005-2010", to expose how the fund uses organizations like the National Board of Governors to buy off local governors, mayors, and even "non-green voices", aka, their opposition. "The RBF organized and funded some of the earliest meetings of advocates addressing climate change. It was also during this period that the U.N. Intergovernmental Panel on Climate Change (IPCC) was created in 1988 and formal international negotiations on a climate treaty began in 1991; these culminated in Rio de Janeiro in June 1992 with a U.N. Framework Convention on Climate Change (UNFCCC) that the first President Bush and the U.S. Congress ratified. A review of correspondence between then-RBF president Bill Dietel and program staff clearly indicates that the Rio negotiation and treaty, and the creation of the Intergovernmental Panel on Climate Change, were specific aspirations of the RBF program at the time.”In yet another connection, The Rockefeller Brothers Fund, working with a man named William K. Reilly, compiled and edited three publications concerning the environment. This same William K Reilly, while serving in the Bush Cabinet, accompanied then-Senator Al Gore, to the U.N. Conference on Environment and Development in Rio de Janeiro in 1992. There, he publicly urged President Bush to sign Agenda 21, and the Framework Convention on Climate Change, and ridiculed the President for not signing the Convention on Biological Diversity. Blue Moon Fund - The Blue Moon Fund is a "campaign supporter" of the Tri-State Transportation Campaign, and once funded a study called "Trust, Cooperation, and Implementation of Sustainability Programs: The Case of Local Agenda 21." According to the author of this study, "this paper provides evidence of the role of trust in ensuring desirable economic outcomes. We examine the implementation of Local Agenda 21 (LA21)..."
Geraldine R. Dodge Foundation - Two associates, Mary Lee Fitzgerald, and Scott McVay, of the Geraldine R. Dodge Foundation, another funder of the TSTC, are listed as contributors for a book titled, "Education for Sustainability: An Agenda for Action", which discusses U.N. Agenda 21 outlining "the platform which education in the future must be launched." This same Geraldine R. Dodge Foundation has given Sustainable Jersey much of its financial support. Sustainable New Jersey has, in the past, been accused of pushing Agenda 21. "ITDP has also participated in the Climate Action Network (CAN) to ensure that the transportation provisions of the Global Climate Convention (GCN) and the Agenda 21, signed at the Environmental Earth Summit in Rio de Janeiro in June 1992, are fully implemented." The President of the New-Land Foundation's Board of Directors is a man named Hal Harvey, who has been accused by some as being "a far-left, Obama-supporting (and -contributing) environmental extremist who founded the Energy Foundation and is president of the crackpot enviro/population control-advocating New-Land Foundation." Important to note, The Energy Foundation is a "campaign supporter" of the TSTC, as well as another organization where Hal Harvey sits on the Board of Directors, the Joyce Mertz-Gilmore Foundation. Four other organizations, The Energy Foundation, The Rauch Foundation, The Scherman Foundation, and The Surdna Foundation, listed as "campaign supporters" on TSTC's website, are also financial supporters of the infamous, Agenda-21 pushing, organization, ICLEI (International Council for Local Environmental Initiatives), which is a movement "created as a non-governmental spin-off by the United Nations in 1990 to implement Agenda 21 locally across the world. It is a membership organization for cities; 7,807 worldwide as of 2012." Important to note, The Rockefeller Brothers Fund is also a supporter of ICLEI. As we can see, this is an extremely organized, well-funded, interweaving, and complex operation, in which the information, and connections, are nearly endless, however, I will continue my effort to document, and expose, these connections, in Connecticut, in relation Agenda 21, and the organizations, and people, forcing this plan into our local communities.